Noemi has been a devoted practitioner of yoga since her first trip to India in 2003. Her teaching is inspired by traditional Hatha Yoga and the Krishnmachrya lineage of Ashtanga, Vinyasa Krama and Viniyoga, which she combines with the modern innovations of Vinyasa Flow. 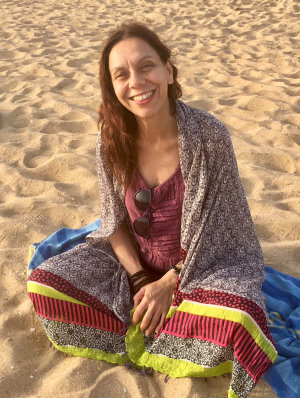 She holds a 500-hour teaching qualification from the British Wheel of Yoga, 300 hours Prana Vinyasa Flow with Samudra (Shiva Rea) and continues to study Yoga therapy and philosophy within the Viniyoga tradition at Sadhana Mala. Noemi teaches full-time in London. In accordance with Hatha Yoga philosophy, she integrates dynamic/invigorating "solar" Vinyasa with gentler "lunar" restorative practices, depending on the time of day and the flow of the class. She pays great attention to the precision of the breath, the movement and the alignment. Modifications and adaptations are always offered to suit the different needs of the class. Sessions will be open to all abilities including beginners. Morning sessions will include energetic Vinyasa sequences taught in a dynamic rhythm followed by pranayama (breathwork) and short meditation. The evening class shall be devoted to a gentler slower vinyasa examining the different postures in more introspective detail followed by pranayama, introduction to yoga philosophy and Yoga Nidra.